Calling all K-Hackers! As I continue my quest to identify the optimum sidecar for my K bike, I have stumbled into a sewer of doubt sowed by some who say drive shaft failure is "rampant" when K's endure the stress of a sidecar. My previous '04 BMW K1200 RS with Hannigan was great success and wickedly fast. In researching, I've talked to a few US & OZ sidecar who have had success, particularly with hard-to-find EML hacks. Any comments as to suitability of a K Brick as a tug appreciated. That is incorrect. I ran a hack on a K75 for 40k miles with no spline lube and that driveshaft and final drive are still with me today. Would they be better looking if I had done the requisite lube? Yes, absolutely. Will the shaft and drive splines wear faster with the extra weight to pull? Yes, but that's what preventative maintenance is for -- more maintenance = less wear no matter how much weight you're pulling. Is a sidecar more weight than two moderately overweight Americans riding two up? Not by much, but nobody tells them not to do that. Do I have a sidecar on a k75 now? Yes, absolutely, but this time I have a Bruno-rebuilt driveshaft and final drive on that tug and expect many many thousands of miles from it. I think a K100 would be an awesome tug. I have used a K75 as a tug on freeways but rarely if ever went over 75mpg with it, not because the engine couldn't handle it but because I had no leading link or any other sidecar-specific hardware and it was just too much work to control at that speed. So -- they're wrong, but there's no point in telling them that because naysayers rule the world. Just do it. If you need a subframe, contact Jay at Dauntless Motors in Enumclaw WA. Thanks, MH........that's good solid advice. I have started an email conversation with DMC. Some folks have told me the R1200c is a better tug, but it is so low on horsepower compared to a Brick. All input appreciated. Some folks have told me the R1200c is a better tug, but it is so low on horsepower compared to a Brick. All input appreciated. A low HP 1200 cc should have plenty of torque,which is what you will appreciate most when lugging a chair.Compare the torque numbers for a true understanding. (you may still be justified with your concerns). I agree,the durability of the splines is all about regular lube maintenance. R1200C torque is 72 ft.lbs. @3000! Plus the R is 60 lbs. lighter. Plus the R has 6 speeds. After running up the Utah mountains with a 4-speed 50 hp. Ural, can't be much worse. You could always slap on some commie green camo paint for nostalgia's sake? R1200C torque is 72 ft.lbs. @3000! Plus the R is 60 lbs. lighter..
Hawksley's site lists the R1200C with a kerb weight approximately 40lbs heavier than a 4v K100RS. There are currently 5 K100RS's offered on http://marketplace.ibmwr.org/ads/kbbs. One claims to be an original owner machine with 6600 miles on the clock. One claims to be a pre-production bike certified to be the third one ever made. None of them are unreasonably priced -- check 'em out. Oh, I got the pristine '85 K100RS or the '94 K1100RS for candidates, and not too far away is a 2000 R1200CL w/ Hannigan that's thourougly sorted it out. I am uncertain about which would be the best rig..........the 1100 definitely has the most torque. Personally, Brother Ace, I think befouling Cornbread with a hack would have a profoundly disturbing effect equivalent to Brexit, or bath salts. Yeah,man, especially coming off that rocket ride to 7000 miles of nowhere.......so sweet, just go any hour. I have guilt just thinking about it. The 100rs which was the old guy's restoration, was before I found CornBread, and it's on the dime........either I SC it, or sell it. Can't keep the quadraphonics of four Bricks AND go get a sidecar. So.......there's the Q, add the SC to the K100RS, or get the R1200CL fully rigged one owner, all fresh stuff. Life is hard, and then you die!
. . . or get the R1200CL fully rigged one owner, all fresh stuff. Just get a Fat Boy, Ace. You know you want one. Please your neighbors. This R12CL idea is just coming at it obliquely. Piss on you,Laitch for being so sacreligeous! Well, boys, as my Kally friends tell me, this HAS been real. Other than a few K-EML rigs, I now realize that the R riders have cornered the market of BMW sidecar rigs. We need to rally together to establish a dedicated sub- forum for "K-Bike Sidecar Topics". I'm in. There are a lot more Kbike rigs out there than most people would think though. Outstanding video! Thanks for putting that together.......very professional. Sorry I skipped coming to Hotchkiss. Next year is Finger Lakes, NY? Let's petition High Command to let us have a K-Bike sidecar topic...........and given your proven video production abilities, you be Moderator! My winter project this year is gonna be figuring how to fit a K-75 engine into a Ural to make a Mural. Not my video that belongs to one of the guys that came up from New Mexico. I was too busy hosting and running the rally to even get any decent pictures taken. 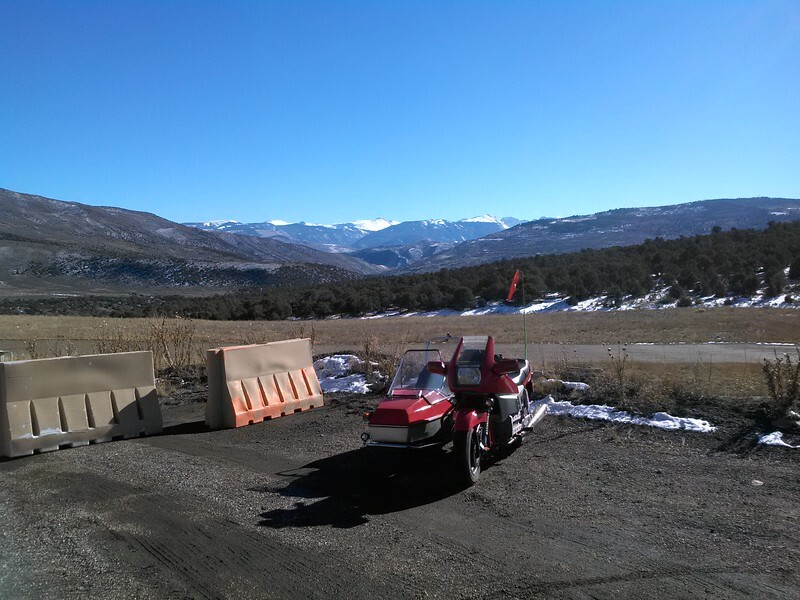 My Winter project is rebuilding the K100/EML rig, after 150,000 miles hauling that tub around it is about due. The final drive seal is leaking and the grub screw in the transmission has loosened up for starters. I also want to get rid of the 16 tooth splines and go with the 20 tooth so I may just try to find a nice low mileage 89 or so and move the drive train into the EML frame. I really hate to kill a good bike so hopefully I will find a good wreck for a donor. You winter project would make for a great photo opp to show all involved in making the rig into what you want. I am going to plan for the NY rally next year. Looks like High Command set up a board for K-rigs! Can you help round up some pics & posts on K-rigs? Mine has the EML factory frame with double sided swing arm and full frame for the bike so it is not fun pulling the transmission and engine so I figure if I have to do it I only want to do it once and hopefully I will not need to do it again for another 150,000. I still need to research to make sure year compatibility but I am pretty sure anything up to 89 should be a straight swap as far as engine and transmission go May need to change some wiring but that just makes it a project instead of a repair. Will do on pictures when I get a chance. What does that EML frame & car weigh? Have you experienced any issues with rear drive bearings? Be interesting to see how the splines look............would think there would be extra wear with all that extra weight. The task of disassembly of that rig, plus re-building clutch/drivetrain,etc. sounds like a major job. Post what you can when you can. SHOUT-OUT TO OZ!!!!! You boys appear to have more K-rigs than we do..........how about sharing some pics & your usual long tales! Good going, Martin! Some years ago I participated in an OZ site that had at least one principal member experienced in K-sidecars. Somebody down there must have K's. LOOKING FOR GOOD K-BIKES W/SIDECARS.............RIGHT OR LEFT, any color, any country, just as long as it has a K-motor. BTW has anyone seen ( ) a K-motor TRIKE! That's the ticket! Ace found 2 rest deleted, I will try to track down if the bike is still around and photograph it if I can. Thanks for the pics, Martin. You've been named Senior K-Rig Foreign Correspondent for the Southern Pacific Region to Motorbrick.Com! Congratulations Mr. SKRFC-SPRMBC! Ace I had to go out and buy a wheelbarrow so I had some way to carry that title.